So, like I said in my previous post for Fresh Blueberry Buttermilk Pie, I have a lot of blueberries to contend with. I usually freeze a ton to have all winter long, but I also keep an equal amount fresh in my fridge because they last so long. I prefer cooking and baking with them fresh, and given it’s the weekend, why not use them in a cocktail? This Blueberry Maple Moscow Mule was my pregame drink for my 20th high school reunion last weekend. Of course I was going to need some liquid courage before walking into a room full of people I haven’t seen in 20 years. I was looking forward to seeing, laughing, and reminiscing with friends I had very much lost touch with, though. By no stretch would I consider high school my golden years like it is often played up to be, but it was a very unique time in my life. When you put a 20 year gap between an angst-filled time in your life, you have a tendency to look back on it a little more fondly. High school is a lot of tepidly feeling out who you identify with, trying to be definitive about how you want to be, and then it really all being swept away once you leave. Oh, how I looked forward to leaving! Although I had a group of wonderful, dear friends, I felt like I was in adult-world purgatory. You think you have it all figured out and can’t wait to put it all to the test. Turns out adult-world purgatory lasts a lot longer than high school, but it does get exponentially better. Until I saw all those familiar faces again, I didn’t realize how many good times there were to reminisce about. It was a blast reconnecting with people who were all in the same boat and shared the same hometown. It was equally lovely making connections with people I never really did hang out with in high school, and, in retrospect, really wish I had. With no high school trepidation to get in the way, there were a lot of genuine hugs, smiles, and laughs. A great time was had because the best part of a high school reunion is you aren’t actually in high school anymore. Cheers to that. 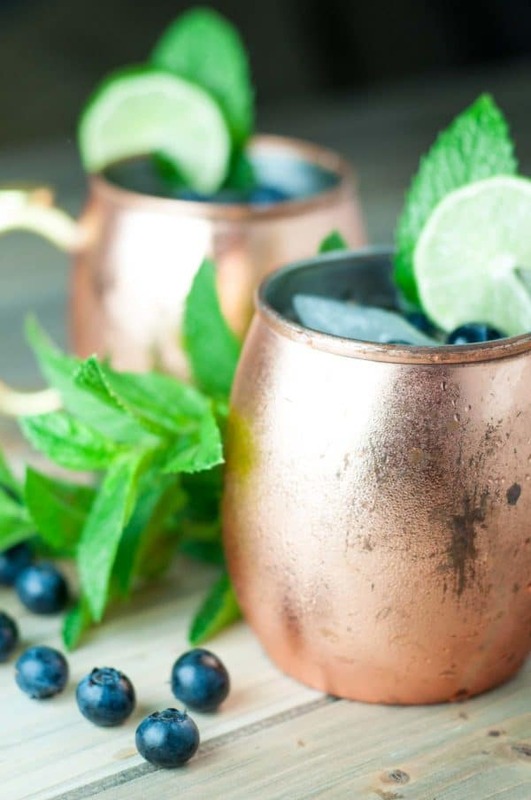 Blueberry Maple Moscow Mule is lightly sweetened with pure maple syrup and muddled fresh blueberries. It is a the perfect light, refreshing summer cocktail! 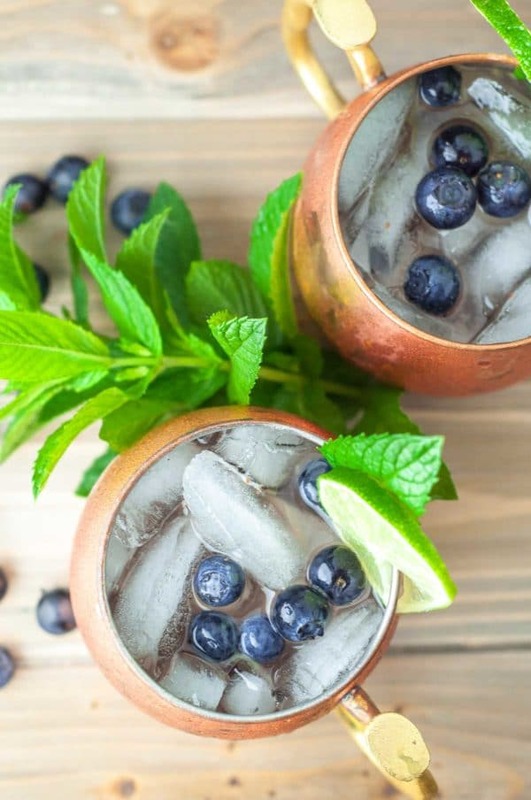 Set aside some blueberries for the garnish and muddle the remaining in the bottom of your glass with the maple syrup, lime juice and few mint leaves. Pour in vodka and ginger beer, stir, and then fill glass with ice. Garnish with remaining blueberries and mint. Perfect description of high school – adult pergatory🤣! Can’t wait to try this Moscow Mule, it’s 116 degrees in So Cal today, can’t think of a better time for this! Holy hotness! I think you deserve more than one of these. Drink up! Moscow Mules are a very popular drink at our house. I love this variation on the classic! Enjoyed by all at my dinner club! 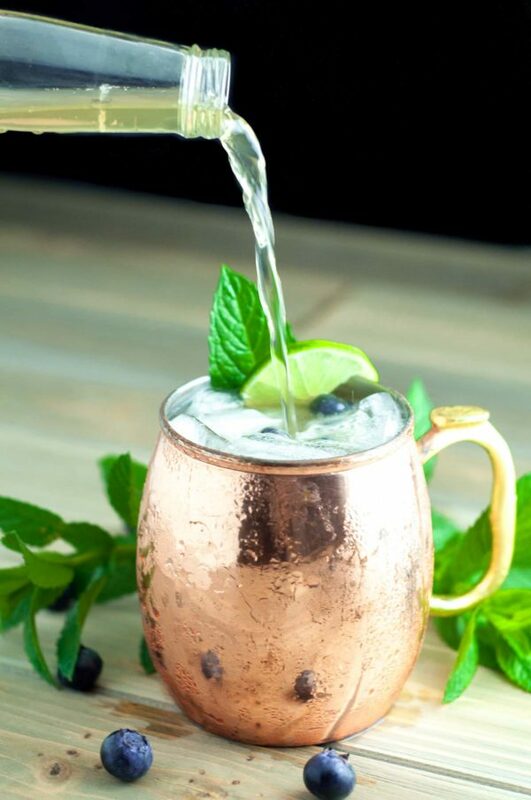 Hi Julie, The possibilities are endless with Moscow Mules. Can’t wait to come up with some more. So glad you liked them!